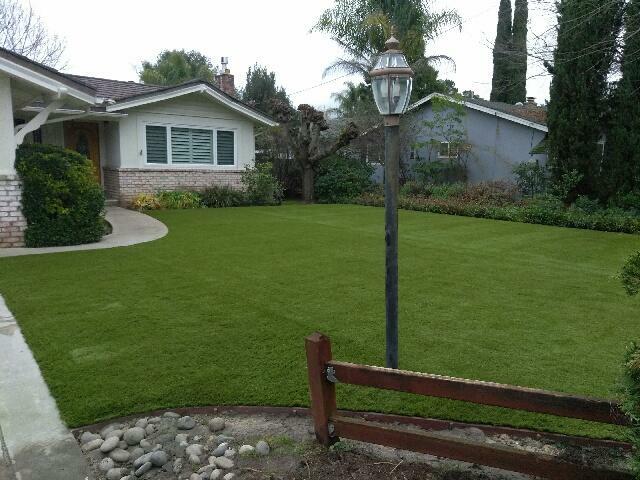 Installing artificial grass is one of the best processes that you can experience for your yard. Once the process begins it is quick to install yet there are a few questions you should ask beforehand. When you take the journey to install artificial grass, it is best to have as much knowledge about the process as possible. Having knowledge about the process helps you understand everything that’s happening in your yard. In the recent years, artificial grass has gained huge popularity in residential communities. However, most people who are looking to install artificial grass have little to no prior experience with artificial grass. What’s the life expectancy of artificial grass? Are there any special maintenance requirements? What can I do if I don’t like the installation? Artificial grass comes with a big upfront cost — $5 to $20 per square foot, installed. However, once it’s installed it’s free for the next 15 to 25 years. The average cost per square feet is $12.50, which typically comes out at a cost of $6,250 for the average yard. Although this initial cost is high, the continuous ongoing cost is second to none. Artificial grass is the best investment you can make for your yard, time, and money. It gives you the ability to use your yard year round and enjoy time with your family. The actual life expectancy of artificial grass is dependent on the use and care of the grass. Although you don't have to fertilize, cut, or pull out weeds there are still a few maintenance things you should do to your artificial grass. For most homeowners a light rinse once a week is an efficient schedule to keeping their yard looking beautiful. Every two weeks they typically remove any leaves, twigs, dirt, and other debris that may build up. Generally, artificial grass will last for 15 to 20 years without having to be replaced. Yes, as mentioned above there are some good maintenance practices that you should use on your artificial grass. Check out are an article about how to keep your artificial grass clean. This is one of the most important things you can know when installing artificial grass. You don’t want to have John Doe installing your grass because he watched a DIY YouTube video on installing artificial grass. After confirming they have their licenses, ask to see their work and talk to a previous client. After you talk to a previous customer you can know what to expect from the crew. Remember the owner may be wonderful, experienced, and knowledgeable but for the most part, his crew members are the ones who will work in your yard. Be sure to address any of your concerns to a previous customer, so that you can get honest feedback. If you don’t like the installation, the first thing to do is find out what you don’t like about it. Understanding the root of the problem is the best course of actions to making sure you can solve it correctly. A great thing about installing artificial grass is that it’s generally easy to modify. Unlike regular grass, artificial grass does not have to use soil. This gives installers the ability to lay it down or pick it up with ease. Talk to the head crew leader about what you don’t like about your installation. See if they can resolve your issue and if they can't talk to the owner of the company. Here at Artificial Grass Pros we take pride in customer service and will always try our best to leave you satisfied. Also, don’t hesitate to ask questions and voice your concerns during the installation process. The best way to avoid final installation unhappiness is to keep an open flow of communication. Plus the crew loves when you ask questions because they can insure that you’ll love the end results. QUESTION: my wife is inquiring about patio table and chairs on artificial turf…would this cause any permanent problems? The feet of the table and chairs do not pose a problem but the foot traffic around it does. The repetitive foot steps around it will eventually mat the grass down if used often. If you do not use the table that often then it is not a concern. My recommendation is to try to move the table around a bit if possible to spread the effect of matting down.